The common tasks carried out by the Security Administrator include – installing and administering issues related to the security system of the organization. 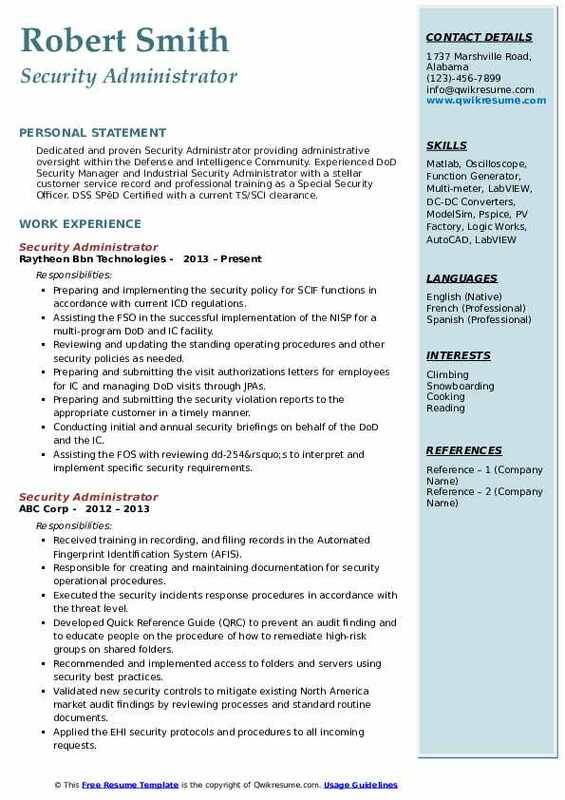 Even though the job description for this post may vary from company to company, the following are the general tasks that are mentioned on the Security Administrator Resume – protecting system against predicted and unpredicted attacks or access; performing network scanning and vulnerability assessment, configuring and supporting security tools, training employees on security awareness, conducting security audits and providing technical assistance whenever needed. Some of the crucial skills that determine the success of a Security Administrator include – a very good understanding of common security protocols, a very good knowledge of firewall technologies, deep understanding of various operating systems, and excellence in security fundamentals. Knowledge of Juniper/ Cisco/ Checkpoint; an expert knowledge IDS and IPS. While some employers are satisfied with an Associate’s degree and a lot of work experience, many want firmly a Bachelor’s degree in Computer Science or Cyber Security. 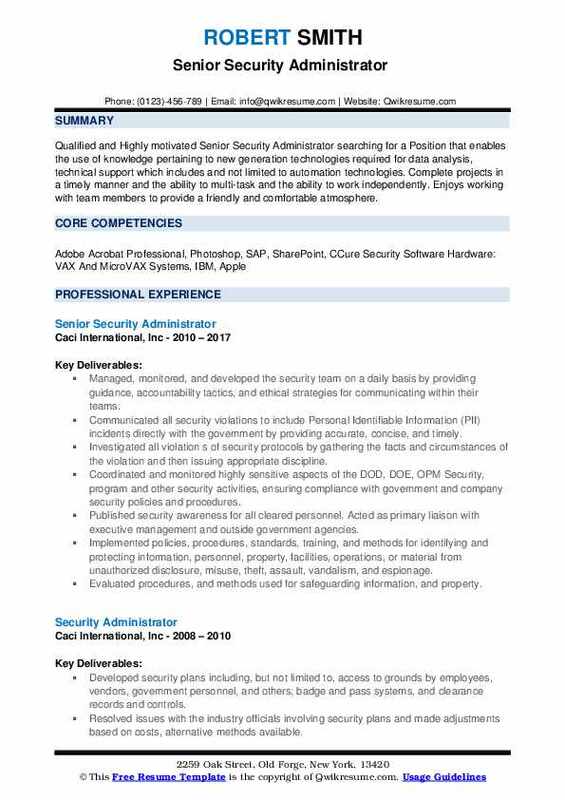 Summary : Security Administrator with 8 years of experience in Security Information Technology with a demonstrated record of delivering system access on multi-platforms for individuals according to company policies. Provides solutions to data access and analyzing data so that it provides only the access that is required. Provides audits regarding system access and users. Passion for troubleshooting problems and solutions for customers as well as employees. Provisioning all access-related requests to new hire - account creation with preliminary access. User provisioning and de-provisioning of employees, trading partners, and third-party users through wave set. Managing the directory services groups and the active directory groups in wave set. Handling the business roles, IT roles and the application roles in the OIM. Managing account delegation and identity verification delegates for the user accounts and handling various process accounts in the system. Involved in the enhancement of the reporting tool in LDAP and took the responsibility for the data cleanup of the entire list of administrative and non-admin groups in directory services. Worked in the documentation of the disaster recovery process for directory services and as well handled tabletop exercise. Maintaining the health check reports and processes by monitoring the servers regularly. Summary : Qualified and Highly motivated Senior Security Administrator searching for a Position that enables the use of knowledge pertaining to new generation technologies required for data analysis, technical support which includes and not limited to automation technologies. Complete projects in a timely manner and the ability to multi-task and the ability to work independently. Enjoys working with team members to provide a friendly and comfortable atmosphere. Managed, monitored, and developed the security team on a daily basis by providing guidance, accountability tactics, and ethical strategies for communicating within their teams. Communicated all security violations to include Personal Identifiable Information (PII) incidents directly with the government by providing accurate, concise, and timely. Investigated all violation s of security protocols by gathering the facts and circumstances of the violation and then issuing appropriate discipline. Coordinated and monitored highly sensitive aspects of the DOD, DOE, OPM Security, program and other security activities, ensuring compliance with government and company security policies and procedures. Published security awareness for all cleared personnel. Acted as primary liaison with executive management and outside government agencies. Implemented policies, procedures, standards, training, and methods for identifying and protecting information, personnel, property, facilities, operations, or material from unauthorized disclosure, misuse, theft, assault, vandalism, and espionage. Evaluated procedures, and methods used for safeguarding information, and property. 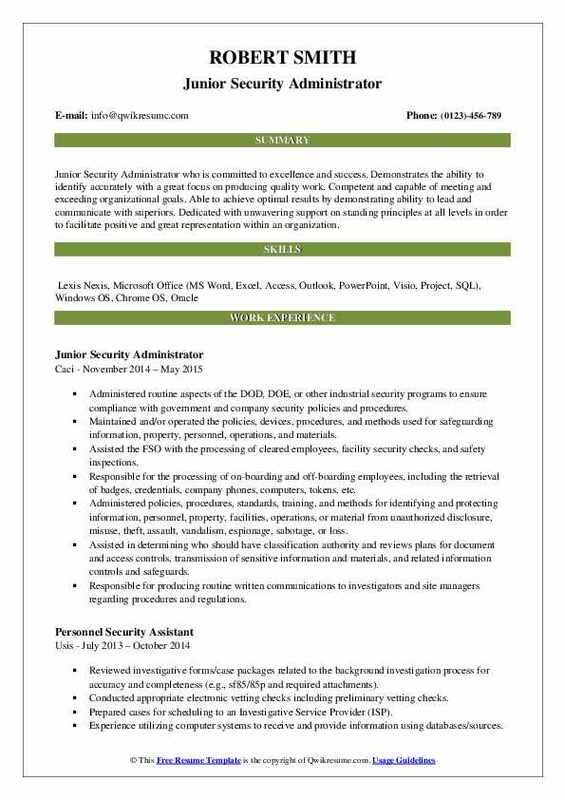 Objective : Junior Security Administrator who is committed to excellence and success. Demonstrates the ability to identify accurately with a great focus on producing quality work. Competent and capable of meeting and exceeding organizational goals. Able to achieve optimal results by demonstrating ability to lead and communicate with superiors. Dedicated with unwavering support on standing principles at all levels in order to facilitate positive and great representation within an organization. Administered routine aspects of the DOD, DOE, or other industrial security programs to ensure compliance with government and company security policies and procedures. Maintained and/or operated the policies, devices, procedures, and methods used for safeguarding information, property, personnel, operations, and materials. Assisted the FSO with the processing of cleared employees, facility security checks, and safety inspections. Responsible for the processing of on-boarding and off-boarding employees, including the retrieval of badges, credentials, company phones, computers, tokens, etc. Administered policies, procedures, standards, training, and methods for identifying and protecting information, personnel, property, facilities, operations, or material from unauthorized disclosure, misuse, theft, assault, vandalism, espionage, sabotage, or loss. Assisted in determining who should have classification authority and reviews plans for document and access controls, transmission of sensitive information and materials, and related information controls and safeguards. Responsible for producing routine written communications to investigators and site managers regarding procedures and regulations. Summary : A self-motivated Sr. Security Administrator with advanced leadership and Industrial Security, seeking a full-time position with career growth potential. 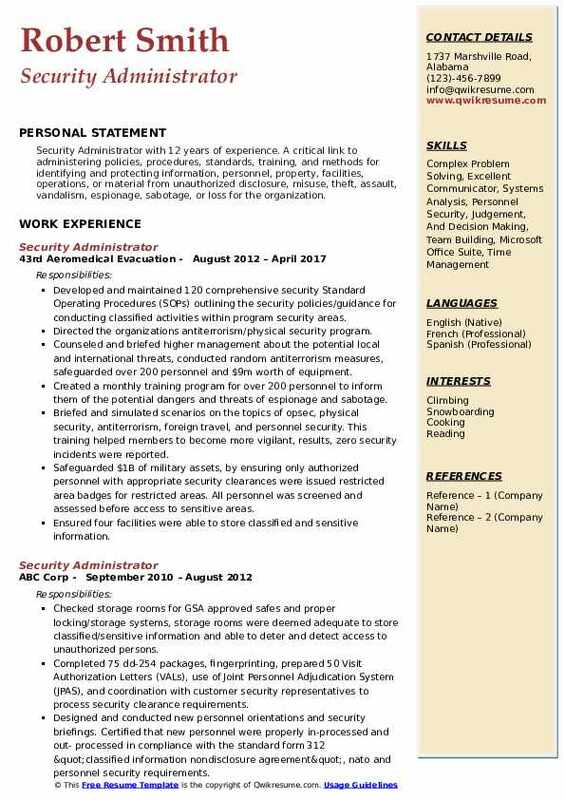 I have over 10 years of experience working helping manage a team in industrial security, as well as the operation of three very successful stores. I have a proven knowledge of skills and success in my dominant fields and would like to apply my experience into your company in hopes of betterment and gain for us both in the long run. Provided desktop support at a senior level for 1 year then got promoted to security administrator reporting to the vice-president of it. Provided corporate training and support in the USA and Mexico where travel was required. Currently, administrate active directory database for 2000+ users with 48 locations in the USA, Mexico, and Europe. Troubleshooting Dell desktop and laptops issues. Restoring the OS and data accordingly. Modifying the users in AD according to managers request for permission access. Managing the life-cycle for AD accounts for SOX compliance and security controls. Scheduling the meeting with vendors for finding sound solutions to current issues. Creating processes for permissions, access related to SOX and SAS70 compliance. Creating business unit sites in SharePoint 2007, currently migrating to SharePoint 2010. Managing 300+ contractor ad accounts which require periodic renewal per corporate policy. Headline : Dedicated and proven Security Administrator providing administrative oversight within the Defense and Intelligence Community. 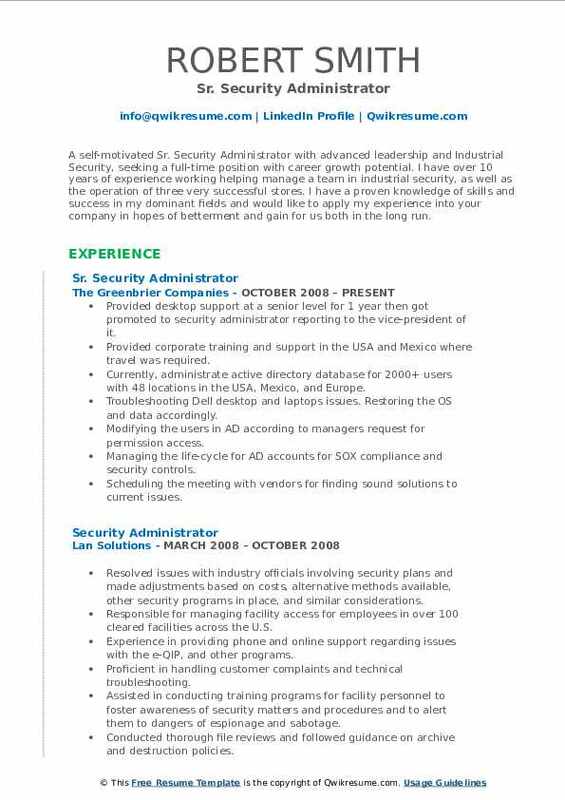 Experienced DoD Security Manager and Industrial Security Administrator with a stellar customer service record and professional training as a Special Security Officer. DSS SPēD Certified with a current TS/SCI clearance. Preparing and implementing the security policy for SCIF functions in accordance with current ICD regulations. Assisting the FSO in the successful implementation of the NISP for a multi-program DoD and IC facility. Reviewing and updating the standing operating procedures and other security policies as needed. Preparing and submitting the visit authorizations letters for employees for IC and managing DoD visits through JPAs. Preparing and submitting the security violation reports to the appropriate customer in a timely manner. Conducting initial and annual security briefings on behalf of the DoD and the IC. Assisting the FOS with reviewing dd-254’s to interpret and implement specific security requirements. Controlling, tracking, and transmitting classified material while maintaining accountability via sims database. Assisting the ISSM in information systems security officer duties for multiple dod and ic programs. Presenting the security education briefings to employees at multiple facilities throughout the cooperation. Maintaining a successful working relationship with the DoD and IC customers. 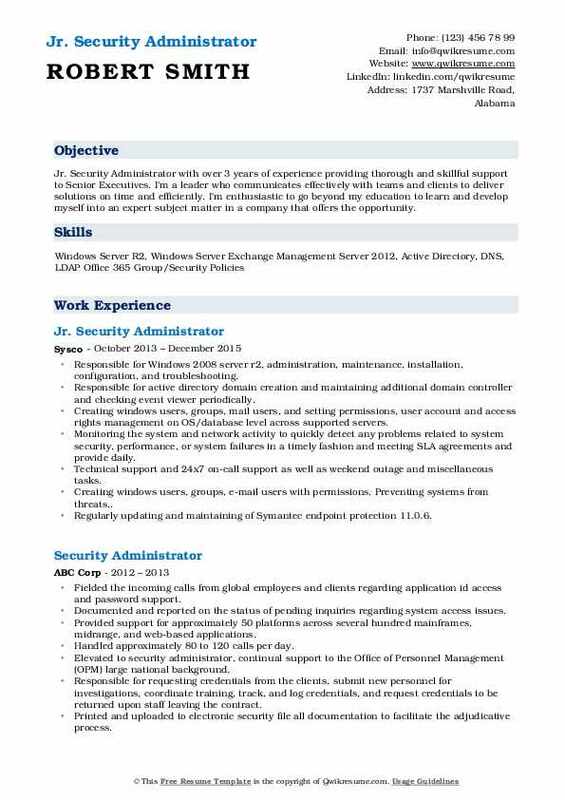 Objective : Jr. Security Administrator with over 3 years of experience providing thorough and skillful support to Senior Executives. I'm a leader who communicates effectively with teams and clients to deliver solutions on time and efficiently. I'm enthusiastic to go beyond my education to learn and develop myself into an expert subject matter in a company that offers the opportunity. Responsible for Windows 2008 server r2, administration, maintenance, installation, configuration, and troubleshooting. Responsible for active directory domain creation and maintaining additional domain controller and checking event viewer periodically. Creating windows users, groups, mail users, and setting permissions, user account and access rights management on OS/database level across supported servers. Monitoring the system and network activity to quickly detect any problems related to system security, performance, or system failures in a timely fashion and meeting SLA agreements and provide daily. Technical support and 24x7 on-call support as well as weekend outage and miscellaneous tasks. Creating windows users, groups, e-mail users with permissions. Preventing systems from threats,. Regularly updating and maintaining of Symantec endpoint protection 11.0.6. Administration of windows 2003 servers, domain controllers, ADs, DHCP, backup of system state and data using windows backup. Contributed to design proposals presented to client for verification and approval. 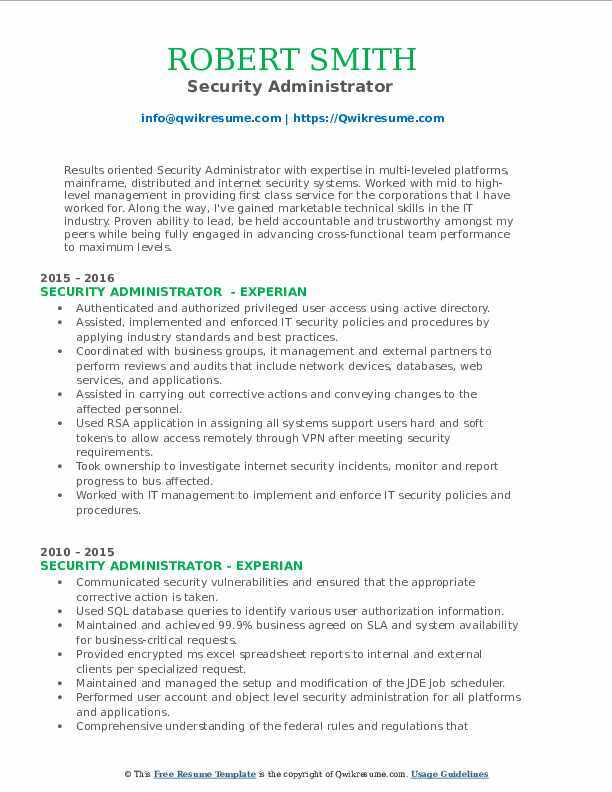 Headline : Results oriented Security Administrator with expertise in multi-leveled platforms, mainframe, distributed and internet security systems. Worked with mid to high-level management in providing first class service for the corporations that I have worked for. Along the way, I've gained marketable technical skills in the IT industry. Proven ability to lead, be held accountable and trustworthy amongst my peers while being fully engaged in advancing cross-functional team performance to maximum levels. Authenticated and authorized privileged user access using active directory. Assisted, implemented and enforced IT security policies and procedures by applying industry standards and best practices. Coordinated with business groups, it management and external partners to perform reviews and audits that include network devices, databases, web services, and applications. Assisted in carrying out corrective actions and conveying changes to the affected personnel. Used RSA application in assigning all systems support users hard and soft tokens to allow access remotely through VPN after meeting security requirements. Took ownership to investigate internet security incidents, monitor and report progress to bus affected. Worked with IT management to implement and enforce IT security policies and procedures. Used Bladelogic application tool in order to assign privileges to small or large user groups to acquire access on UNIX systems. 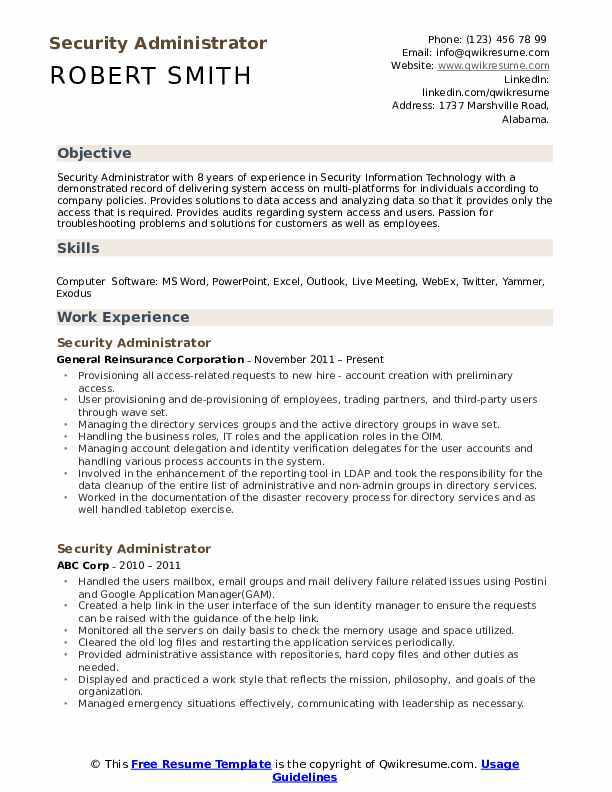 Objective : A dedicated and well- organized Security Administrator, who enjoys working in a challenging environment. Good at the documentation, a quick learner and a team player who communicate in English, French, and Spanish. A proficient person, who is skilled at multi-tasking and maintaining a strong attention to detail. Maintain professionalism and superior communication skills to meet client and company needs. Implemented network security policies and procedures, protecting against unauthorized access. Analyzed setup monitored and audited required measures to ensure data network performance and security. Ensured that the network continues to function accordingly to the client's security policies standards. Managed the operations and configuration of the network security devices, core, and access switches, and telecommunication links this includes firewalls, PS, core and access switches, VPN access and the supporting network management tools. Management of DNS enhancement, emails security, firewall, and development of firewall. Maintained the security regarding logical and physical access to the system. Analyzed the system deeply to protect it from virus outbreak and from hacker and crackers attacks. Implemented a disaster recovery plan to ensure data backup and recovery. 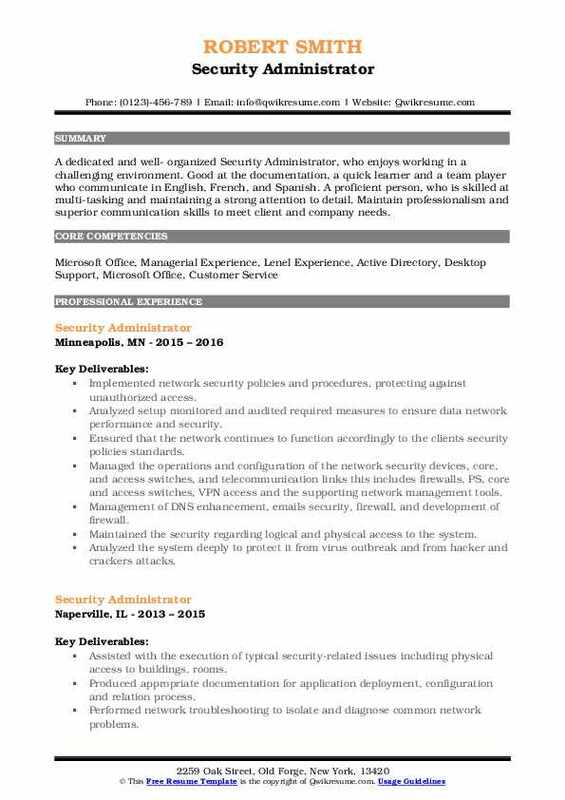 Summary : Security Administrator with 12 years of experience. A critical link to administering policies, procedures, standards, training, and methods for identifying and protecting information, personnel, property, facilities, operations, or material from unauthorized disclosure, misuse, theft, assault, vandalism, espionage, sabotage, or loss for the organization. Developed and maintained 120 comprehensive security Standard Operating Procedures (SOPs) outlining the security policies/guidance for conducting classified activities within program security areas. Directed the organization's antiterrorism/physical security program. Counseled and briefed higher management about the potential local and international threats, conducted random antiterrorism measures, safeguarded over 200 personnel and $9m worth of equipment. Created a monthly training program for over 200 personnel to inform them of the potential dangers and threats of espionage and sabotage. Briefed and simulated scenarios on the topics of opsec, physical security, antiterrorism, foreign travel, and personnel security. This training helped members to become more vigilant, results, zero security incidents were reported. Safeguarded $1B of military assets, by ensuring only authorized personnel with appropriate security clearances were issued restricted area badges for restricted areas. All personnel was screened and assessed before access to sensitive areas. Ensured four facilities were able to store classified and sensitive information.